Chris Gayle is a mercurial player on the field. There is a saying ‘The party doesn’t begin till the police show up.’ In this case the police showed up to bust the party. The hotel employees maintained that no illegal activity was at hand: “There was no wrongdoing on the part of the players or the women and we are surprised at the police action. It is not against the law to be a guest of a player.” said an employee of the hotel. "I haven't touched yours yet." 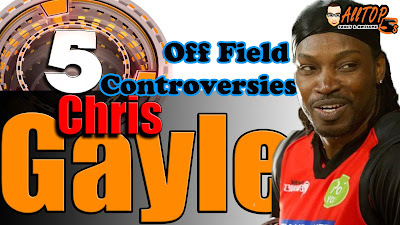 Chris Gayle caused raised eyebrows when he was seen dancing vigrously with Sherlyn Chopra at a night club. He even took off his shirt in the middle of the dance. Many commented later that cricketers should not be involved in such clubs and activities. While it is obvious that many other cricketers indulge in strip clubs, few are open enough to take a picture of themselves in one, let alone install one in their home. Gayle has come under intense scrutiny for his comments and has issued an apology which has also come under fire. Gayle has been fined $10,000 for the incident and his comments have been condemned by his team’s chief executive.